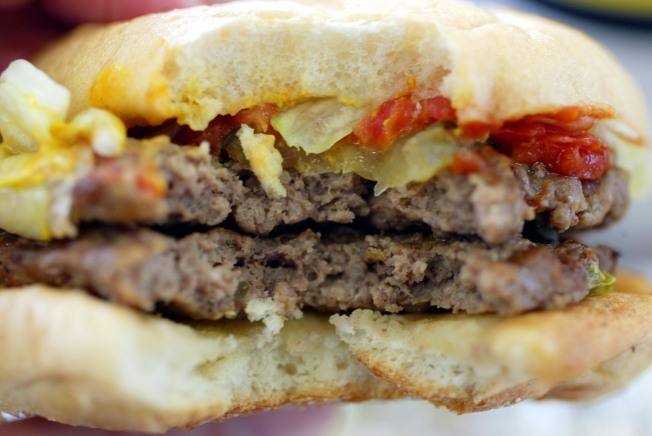 Four Chicago Burger Joints Among Best in U.S. The Bleepin' Blago Burger, the burger of the month at Kuma's Corners, will soon come to an end. What's in store for February? Toss the deep dish and fry the doughnuts, Chicago is apparently home to some of the best burger joints in the country. According to a new ranking by Foursquare, the city is home to four of the nation’s 50 best burger restaurants. Chicago’s Kuma’s Corner was the only city venue to make the top 10 on the list, coming in at 6th place. The restaurant was closely followed by Au Cheval at no.16, DMK Burger Bar at no. 18 and Burger Bar at no. 49. The top three burger locals on the list were in New York City—Minetta Tavern, Burger Joint and Shake Shack. Earlier this year, two Chicago doughnut shops were named among the best in the country and last year the city made a list of "Best Pizzas in America."